The Guide to the 120 restaurants of the country “Mexico Gastronómico 2019“, which is developed jointly by S.Pellegrino, Nespresso and Mexican Culinary, named Gabriela Ruiz Lugo, from Tabasco, as the Best Mexican Chef for 2019.
international competition that aims to provide young talented chefs with easier access to the world of gastronomy and encourage their professional growth. 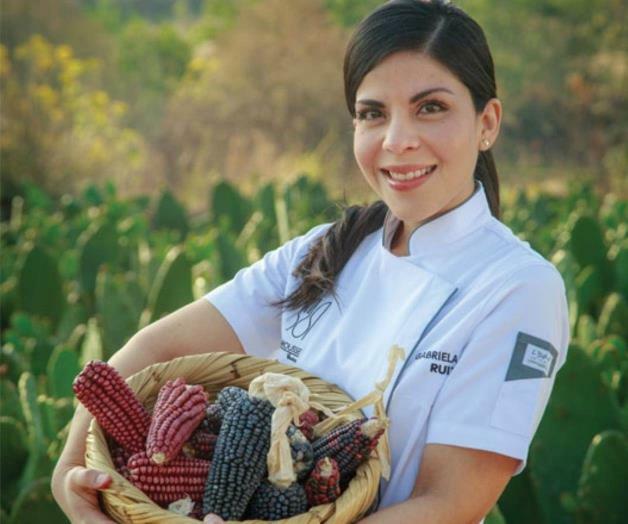 For the native of Comalcalco Tabasco, having been distinguished with the appointment implies a great responsibility that even led her to rethink her activity in order to improve her skills and be worthy of being named the best chef in the country. recognition, the fact that the voters have thought about me, is an honor that fills me with pride,” she said in an interview with Mexico’s news agency Notimex. cuisine and that have allowed her to bring the flavors of “the Eden” to the world. became a flagship restaurant in the southeastern part of the country. “it is an adventure to be a chef” she said. Later, in Mexico City, she established Carmela y Sal, a restaurant located on Virreyes Avenue, that consolidated her as a chef that knows how to harmonize the Spanish, pre-Hispanic and her family’s flavors in different unique dishes. At Carmela y Sal, people can taste the “tierra de luna” a creation made with mature banana, filled with beans, other plates made with coconut that deceive the diner and makes him believe that it is meat and desserts based on bananas with milk candy, whipped cream and caramel powder.